OHSWEKEN, Ont. 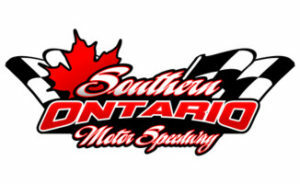 (September 7, 2018) – Josh Hansen, a 16-year-old driver from Beamsville, Ont., took full advantage of a Lucas Smith misstep on lap 17 and led the final four laps to score his first career Sprint Car win in the final race of the Action Sprint Tour powered by RaceRivalz.com inaugural season at Ohsweken Speedway on Friday, September 7. Smith and Liam Martin lined up on the front row for the 20-lap championship Feature which saw Shone Evans, Aaron Turkey and Jacob Dykstra all enter with a chance at the inaugural series title. Both Smith and Martin declined to take the Durnin Motors Front Row Challenge and drop to the 12th starting position for a shot at a $500 win bonus. The opening lap was disastrous for contenders Turkey and Dykstra, who were collected in a backstretch incident that also involved Trevor Young. Both drivers suffered race-ending damage, eliminating them from championship contention and handing the title to Evans. The ensuing restart saw Martin drive to the inside in a bid for the lead, but Smith held off the challenge with a strong drive up top. Then on lap four it was Baily Heard driving to second past Martin following an excellent multi-lap battle before the caution waved the following lap when Holly Porter spun to bring out the yellow flag. The restart saw Heard challenge Smith to the inside and the two drivers raced side-by-side until the next caution on lap eight when Brad Herron spun in turn three. The final restart on lap eight saw Heard try to drive outside Smith in turn one, but the challenge was unsuccessful. Smith opened a considerable lead before ninth-starting Josh Hansen raced past Heard to take second on lap 14. Then, on lap 17, Smith stepped over the banking in turn three, allowing Hansen to use the bottom lane and drive to the lead. 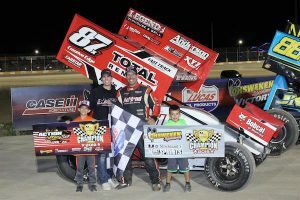 Smith held on to the second spot, but the 16-year-old Hansen ran a flawless final three laps to score his first career Sprint Car win while Smith settled for second ahead of Shone Evans. 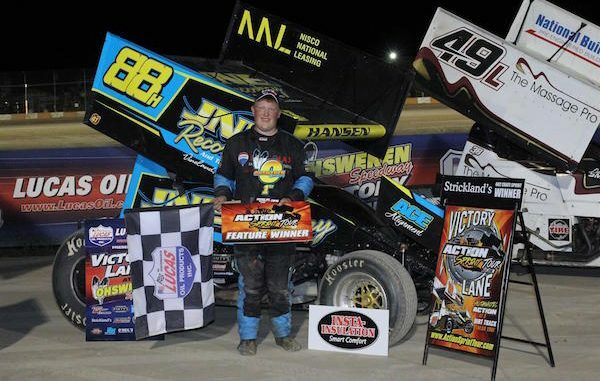 With his third-place finish, Evans claimed both the Action Sprint Tour powered by RaceRivalz.com title and the Ohsweken Strickland’s GMC Crate Sprint Car 2018 Championship. Evans’ podium finish would have been enough to earn both titles, even if Turkey and Dykstra would have finished first and second. Ryan Hunsinger drove from the 21st starting spot to fourth while Baily Heard took a fifth-place result. Liam Martin, Jordan Hill and Hannah Ferrell were Heat Race winners earlier in the night while Aaron Turkey won the B-Main. Stay tuned to www.ActionSprintTour.com for details regarding the Series year-end payouts and banquet information. 1 Holly Porter – Delhi, Ont. 4 Hannah Ferrell – Vanessa, Ont. 5 DJ Christie – Beachville, Ont. 7 Caleb Wood – London, Ont. 9 Paul Ballantyne – Brantford, Ont. 10 Lofton Schuts – Oakland, Ont. 24 Jeff Newham – Windsor, Ont. 38 Derek Miller – Ohsweken, Ont. 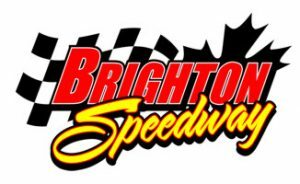 49L Lucas Smith – Brantford, Ont. 51 Trevor Young – Ancaster, Ont. 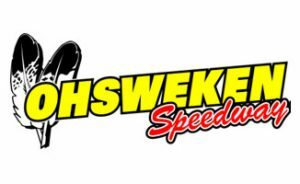 69 Josh Hill – Ohsweken, Ont. 70 Baily Heard – Niagara Falls, Ont. 70mm Dave McKnight Jr. – Brampton, Ont. 74 Rob Neely – Rockwood, Ont.